You'll have to trust me here, because I'm about to try and convince you to buy an absolutely terrible game. It's an adventure game, but it's the sort of adventure game that thinks Myst was the best adventure game. Except this game doesn't even understand why Myst was popular. It thinks Myst was successful because its puzzles didn't make any sense. It thinks Myst was successful because its plot was completely incoherent. It thinks people raved about, instead of riled against, the arbitrary lever-pulling. It hasn't got the faintest idea how to be a point-and-click adventure. It's called Outcry. It's absolutely terrible. And it's one of my favorite games. 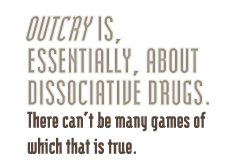 Outcry is the sort of game that makes the job of a reviewer incredibly difficult. There is no option but to condemn it. It simply isn't good enough. At the same time, you've got to communicate just how fascinating your time with the game was, while making it entirely clear that it's broken beyond all comprehension. It is - to use that terrible shorthand - a 6 out of 10. But it's wonderful. Outcry is very, very Russian. There's an idea about the sorts of games that developers from Eastern Europe deliver: they're bleak, dark and philosophical pieces that put artistry before solid game design. Outcry absolutely exemplifies that notion. It's so Russian that it might as well be wandering through Red Square, drinking vodka and wearing a balaclava. It's gritty and grainy, hideously obtuse but remarkably beautiful. It isn't good enough. It's a game, essentially, about dissociative drugs. There can't be many games of which that is true. Summoned by your brother to discuss a scientific breakthrough of astonishing magnitude, you arrive at his abode to find him missing, with his housekeeper completely unaware of where he may be. She invites you in anyway. And you start to look around. Quickly, you find yourself standing in a room, strewn with wires, with an enormous metallic monolith looming ominously in the middle. There are switches and levers and buttons dotted around, but none of them seem to work. There is no indication of why this is the case - it's an absolutely terrible game, after all. So you explore some more. And you begin to find notes and audio recordings, and your brother is addressing you directly. Don't tamper with the equipment, he says. Just make sure it's safe. And don't even think about ingesting the new chemical he's synthesized, from a variety of herbs and plants, which appears to separate mind from body. Your immediate reaction is to get the machine working, sit inside it, and throw the drugs down your hatch. Naturally.